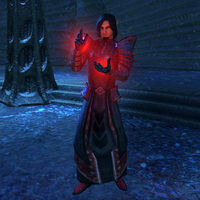 Earl Leythen is an Altmer mage and member of the Court of Bedlam. He is a former member of the Psijic Order, where he was recognized as their language expert. After a personal tragedy Leythen grew distant from the Order and disappeared from sight during the Order's investigations of a Daedric threat on Summerset. As you pick up the investigation with Valsirenn, she reveals during your conversations that Leythen is her husband and that she has been looking for him. Later on you will find out that Leythen has pledged loyalty to Mephala and serves as her earl at the Court of Bedlam. Although Leythen initially appears harsh-spoken, bitter, and generally disappointed in life, he will come to provide valuable assistance in dissolving the Daedric plot over Summerset. The first potential meeting with Leythen is easy to miss, as he is disguised as an anonymous noble in the upper floor of Shimmerene inn. Not particularly interested in talking to you, Leythen will repeatedly ask you to leave him alone. 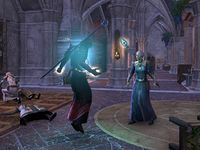 A more proper introduction with Leythen takes place a little bit later, when you help Valsirenn to scout the College of Sapiarchs for a potential Daedra attack. The college is indeed under attack, with Leythen leading the forces as he attempts to gain access to the Resolute Diamonds. After a short and aggressive confrontation, Valsirenn takes Leythen back to Artaeum. Leythen will thereon remain on Artaeum, bound there by attunement magic. As your investigation of the Daedric plot on Summerset continues, Leythen will offer his help several times. 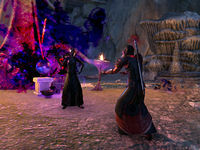 He provides hints as to where find Meridia cultists in Summerset, he offers assistance in translating notes in ancient language, and helps to negotiate the pact between you and his Prince, Mephala. When you ascend the Crystal Tower for the final confrontation with Nocturnal, Leythen will sacrifice himself in order to help you advance further into the tower. Several Psijic mages express their regret over Leythen's choices. Ritemaster Iachesis, once friends with Leythen, still believes him to be a good man, and curses Mephala for corrupting him. Oriandra tells you that Leythen has several talents, among them expertise of ancient and obscure languages and battle magic, and thinks it is a shame he betrayed the Order. The most complicated are Valsirenn's feelings towards her husband. During the conversations with both Valsirenn and Leythen you will learn that the two had a daughter called Ealdaawe, who died of an incurable illness, leaving her parents devastated. The two dealt with the tragedy in different ways: while Valsirenn buried herself in work, Leythen tried to take care of their daughter. Disappointed in Valsirenn's behavior, he grew distant from her and the Psijic Order. 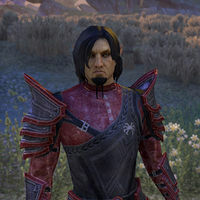 Some time after that, Leythen was sent to investigate the Daedric threat on Summerset, which however somehow led him to join the plot, become a member of the Court of Bedlam and serve as Mephala's trusted earl. Although initially furious over Leythen's betrayal, Valsirenn eventually reconciles with her husband and before you venture to the Crystal Tower they will visit their daughter's shrine together. This is the last time the two will speak – at the Crystal Tower, before Leythen dies he asks you to tell Valsirenn that he and their daughter will be waiting for her. "Spinner save me from fools and altruistic adventurers!" "You there! Tell my darling wife to release me and I'll ask Mephala to kill you quickly when the new age dawns." You're Valsirenn's husband? Why do you serve the Daedra now? "Spinner save me from fools and altruistic adventurers! Valsirenn turned her back on me and my daughter a long time ago. Is it any wonder I've found acceptance and purpose among the Court of Bedlam?" So you betrayed the Psijic Order? "Don't presume to judge my actions, you insignificant flea! I am an earl in the Court of Bedlam now, chosen personally by Mephala to represent her on this all-too-fragile world. Leave me! I'm done speaking to you now!" After this conversation Valsirenn will take Leythen back to Artaeum with her. You will not meet Leythen again until the next quest. "Do you actually believe that all Daedric cultists know each other? I hate to disappoint you. We don't." Earl Leythen: "I never planned to come back here. The memories are ... painful." Valsirenn: "I still can't believe I had to find you and drag you back. Was our time together really so terrible?" Earl Leythen: "You still don't understand. Our daughter will never again see this view. Or hold my hand. Or ... or ... anything." "I suppose it's too much for a prisoner to expect a few moments of solitude with his thoughts. Ah, well. So what can I do for you? Has the Ritemaster sent you to interrogate me? Doesn't he trust my wife's talents in that regard?" Is there a Meridia cult on Summerset? "What a curious question. Do you actually believe that all Daedric cultists know each other? I hate to disappoint you. We don't. Although, I can tell you that there are a lot fewer of the Lady of Life's followers now than there were before." "The Court of Bedlam has been actively eliminating the competition, as it were. Oh, I wasn't personally involved, but I have it on good authority that the Meridia shrine hidden to the north of Shimmerene has been ... disposed of." 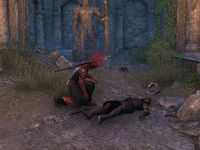 The Court of Bedlam killed all of Meridia's followers in Summerset? "All? Who can say? I imagine that one or two of them scurried down a dark hole before the blade fell. Like rats, her followers are! I believe I have said everything I'm going to on this subject. Now shove off." I guess I could go search around to the north of Shimmerene. "Haven't you left yet? Don't you have an island full of Altmer to search? Good luck with that, by the way. I've always said, the Court of Bedlam is too efficient for its own good. Meridia's lackeys were probably wiped out to the last cultist." 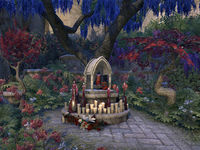 Why would the Court of Bedlam destroy a shrine to Meridia? "Let me let you in on a secret. Just between us, you understand. My Prince Mephala and her partners in the triad have no use for the other Daedric Princes. They've declared war and have already started eliminating their rivals' mortal followers." Tell me more about this war between the Daedric Princes. Why are you telling me this? "Were the words I used too complicated for you to understand? War. As in death and destruction, winners and losers. Mephala, Nocturnal, and Vile plan to win. The other Princes? Most of them don't even realize they're under assault as of yet." Seriously, what does it hurt to tell you about things you can't possibly influence? You and your Psijic friends are nothing when compared to the majesty of Mephala and her Daedric partners." What happened to your daughter? "Never mention my daughter again, you insignificant dolt! Ealdaawe was perfect in every way. She was my sun and moons, and the best thing I ever created. Don't you dare sully her memory with your inane questions!" I heard that you and the Ritemaster were friends. What about your oath to Valsirenn? "Friends? I suppose we were. He's a good leader and an excellent teacher. If I have one regret about turning my back on the Order it's that I had to break my oath to Iachesis." "You pry into subjects best left alone, stranger. I don't know you. You don't know me. I don't see that fact changing, do you? Now get out of my sight before I really forget my manners." As he is visibly angered, it is best you heed Leythen's advice and leave him alone, because he will have nothing more to say to you. "This changes everything. Now I'm really interested in helping you translate the Ritemaster's memory." Earl Leythen: "Interesting. You weren't this attentive when our daughter actually needed you." Valsirenn: "Leythen, I—arrgh! I need to go check on the knight anyway." Earl Leythen: "Val, wait .... Damn it." "By the Spinner's holy webs, when did I become an insufferable arse? Valsirenn didn't deserve that. Ealdaawe was her daughter, too. Why am I talking to you about this? I know it isn't because I like you, because I really don't." I understand you're good with languages. "Is this some new attempt at interrogation? If so, I'm not familiar with the technique. Very well, I'll play along. Yes, I am a master linguist, specializing in ancient and obscure languages. Why do you ask?" The Ritemaster heard these words, but we can't translate them. They may point to the tower crystal. "Intriguing. I've never seen this dialect before. I can translate it, but I need more to work with. I need to examine the original tablets found at Ebon Stadmont. That will never happen, of course. You do remember I'm a prisoner here, don't you?" I can go to Ebon Stadmont. What do you need to complete the translation? "According to those notes, the writing is carved into a massive stone. I doubt you'd be able to carry it back here. All right, you've piqued my interest. Use this rune when you reach Ebon Stadmont and I'll be able to see what you see." What does the rune you gave me do exactly? "Nothing nefarious, if that's what you're asking. Just enter the forest, find the obscure language, and use the rune so I can see what you see. It won't do anything beyond that, I assure you." What can I expect to find in Ebon Stadmont? "According to the scribblings of this Grand Maestro Forte—Spinner's web, that's a pompous title!—the forest is a maze filled with all kinds of beasts and Daedra. As to the reason why, who can say? Sometimes a cursed wood is just a cursed wood." What's going on between you and Valsirenn? "I don't see how that's relevant to our interactions. Not in the least. Still, my words were spiteful, meant to hurt her. There was no need for me to open old wounds. But why does this concern you? I'm your enemy. Are you too dense to see that?" [Persuade] What happened to you and Val was horrible. I'm just trying to help. "You and Iachesis, always sticking your noses into places they don't belong. I suppose I can appreciate that, but kindness won't help you in the coming war. Very well. I'll tell you this. Val loved our daughter and our daughter loved Val." So why do you hate each other? "Hate? I—I'm not sure what emotions I feel right now. But when my daughter was dying, when she was crying for her mother's comfort, Val wasn't there. She was buried in her work, too busy or too frightened to spend those final moments with Ealdaawe." I know you're our enemy. I need to understand you in order to remain one step ahead of you. "Interesting. Honesty and a shrewd tactic. I can appreciate that. Still, my business is my own. I'm not looking for a friend or to rejoin the Psijics. I'll help you because the Court needs to find the tower crystal as much as you do." "I'm not your tour guide! Just pick a direction and start walking." At Ebon Stadmont, you need to use Leythen's Rune to summon him. A projection of Leythen appears, and he seems satisfied, commenting, "Ah, the rune is working perfectly! It's almost as if I'm standing right next to you." "I can feel the powerful magic that permeates this place. I sense a Daedric influence, but something that's far older than my Prince Mephala." "The Maestro's notes said the ancient words were etched into a massive stone. I expect you'll need to travel deeper into the forest to find the exact location. I can't translate the words the Ritemaster heard until you find that stone." How do I find this massive stone covered in the ancient writing? "I'm not your tour guide! Just pick a direction and start walking. Wait a moment. The Maestro's notes. There was a passage that might help. Something about the crows. Maybe that will be enough to guide you." I've been here before, but without a guide there's no way through the maze. "Just retrace your steps. You likely walked past the massive stone and didn't even realize it. Wait a moment. The Maestro's notes had a passage about crows and a path. Just refer to the book and hope for the best, I guess." "The Grand Maestro mentioned Daedra, but I never imagined they'd belong to one of the patrons of the Court of Bedlam. This changes everything. Now I'm really interested in helping you translate the Ritemaster's memory." What do you mean? What's this have to do with Nocturnal? "An excellent question. But we won't learn anything if you continue to stand here and talk to my projection. Get moving and find that inscribed stone." Earl Leythen: "The ancient inscription! You found it!" Earl Leythen: "Something isn't right. I feel—"
Earl Leythen: "Our connection ... breaking up! It's Nocturnal's earl—"
"I can't believe Nocturnal's earl interfered like that. We're supposed to be allies! Why would she want to stop me from reading that ancient inscription?" Nocturnal's earl said that the ancient phrase is a spell. "A spell? Interesting. And somehow connected to the Ritemaster's forgotten hiding place. I wonder why Nocturnal decided to share this information? She isn't usually the most forthcoming of the Court's esteemed Princes." Nocturnal's earl also indicated that you've been informing the Court about our plans. "Right. I told them to interrupt my research before I could unravel an ancient and powerful language. Look, you should come back to Ceporah Tower now. The Ritemaster wants to hear everything my associate shared with you. And frankly, so do I." I'll return to Artaeum as soon as I can. Leythen's projection then disappears, saying, "I just wish I could have spent a few moments studying that inscription." Ritemaster Iachesis: "Oriandra, you should have consulted me beforehand." Earl Leythen: "She saw an opportunity and she took it, Iachesis." Ritemaster Iachesis: "Silence, Leythen! Need I put you in chains to remind you of your status here?" Oriandra: "I'm sorry, Ritemaster. We should have asked permission. It won't happen again." When you talk to Leythen at this point, he comments, "Iachesis is in a mood. I'd watch my step around him if I were you." "Our trip into the cursed wood wasn't a total failure. I had a brief moment to examine the inscription before Nocturnal's earl usurped our connection. I think I know what some of the words from the Ritemaster's memory mean." Did you tell the Ritemaster? "Not yet. He's been in a harsh mood. Besides, I've only been able to make a partial translation." So what do the words you translated mean? "The phrase contains eight distinct words, repeated over and over. I've been able to translate three of them. In. Heart. Unsealed. Do with that information what you will." 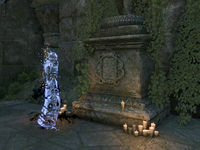 "I'm just guessing, mind you, but I imagine someone with the abilities of a Daedric Prince who possesses the Heart of Transparent Law could walk into the Crystal Tower as easily as you or I could cross the threshold of an inn." Following the disastrous events in Lost in Translation, you return back to Artaeum to discuss the next step with your allies. You will find Valsirenn, Leythen, and Oriandra in Valsirenn's study, Valsirenn being quite furious and interrogating Leythen. Oriandra pleads Valsirenn to go easy: "Valsirenn, stop! You're going to kill him!" Valsirenn, angered and frustrated, tries to calm herself, "Arrghh! Fine! Let our friend finish the interogation." 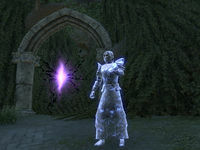 She then turns around and leaves, saying, "Oriandra, tell Darien to meet us at the Crystal Tower Gatehouse. And keep an eye on Leythen while we're gone." [Intimidate] Tell me what the Princes were originally planning or I'll turn you back over to Valsirenn. "Look, you have to let me return to Summerset and warn my Prince. Let me go and I'll convince Mephala to help you. You're going to need my Prince if you really plan to take on Nocturnal and the Crystal Tower. Whatever Nocturnal has planned is a threat to Mephala and the rest of the Court of Bedlam. "And I need to return to Summerset, but it looks like we're both going to be disappointed." Regardless of Leythen's suggestion, you will at this point proceed with Valsirenn's plan to use a Sapiarch ritual in order to gain access to the Crystal Tower. If you talk to Leythen before leaving to Summerset and Crystal Tower, he warns you: "Rushing a spell as complex as the Sapiarch ritual will not end well. I researched the diamond keys to find out how they work, and the magic isn't stable. Mark my words. It can't be accelerated without dire consequences." As it appears, Leythen had right in his fears and the ritual at the Crystal Tower ends in yet another disaster, with both Sapiarchs dead. Although Valsirenn has a new plan, Darien Gautier refuses to help her at this point because he thinks a faster solution is needed. 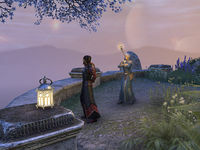 Darien sets Leythen free and returns to Summerset with him, attempting to contact Mephala. You are sent to look for them and will find the two near Cathedral of Webs. It looks like Leythen is trying to open the door inside the cathedral, with Darien urging him, "Hurry up, Leythen! They could find us at any moment!" Leythen replies, "Something's wrong," as he struggles do open the entrance. Annoyed, Darien asks, "Wrong? Why doesn't that surprise me?" "It should have been a simple matter to identify myself and unlock the door. But the spells in place resisted me. It's as if I've lost my status as Mephala's earl ... or as if someone or something interfered with the place's defenses." How did you get off Artaeum? "I spent years on that damnable island. Do you think the Psijics' magic could long hold someone who knows the intricacies of the place? With the Ritemaster's death, the order is in chaos. Only Val ever realized I was missing." How did Nocturnal breach the Crystal Tower without the Resolute Diamonds? 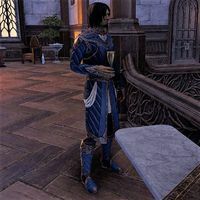 "I'm just guessing, mind you, but I imagine someone with the abilities of a Daedric Prince who possesses the Heart of Transparent Law could walk into the Crystal Tower as easily as you or I could cross the threshold of an inn." Vile offered us a way to reach the Crystal Tower. Can Mephala help us use the Resolute Diamonds? "My Prince deals in secrets and hidden lore. If anyone can activate the keys to the Crystal Tower, she can. That was our original plan, before you intervened. After I acquired the diamonds from the Sapiarchs, I was supposed to bring them to Mephala." "I know you consider my people to be nothing more than crazed cultists, but they didn't deserve this fate." Once inside the Cathedral of Webs, you will find that Mephala's followers have fallen victims to an assault. Leythen kneels down to inspect some of the bodies, quietly asking, "How did this happen? My people should have been safe within these walls!" Darien replies, "Nocturnal's been eliminating the sects of the other Princes. Are you surprised she'd turn on her former allies?" Leythen then says, probably more to himself than Darien, "I recruited most of these men and women. I was responsible for them." Earl Tundilwen: "It pains me that it had to end this way, but my Mistress will not be denied." Earl Tundilwen: "Every action I performed was in the service of Nocturnal's grand plan." Earl Tundilwen: "This was always the plan. Nocturnal's plan." Earl Tundilwen: "Your mistress is weak. Come with me and I'll show you what the true power looks like!" Earl Tundilwen: "This is what the Court wanted all along. An end to the old ways. A new beginning." Earl Tundilwen: "Be silent, knight, or I'll let you taste the blade you once carried. I wish to speak to your friend now." "I answer my earl's summons, only to find him with these ... unworthies. Do you betray me too, Leythen?" Leythen then asks Darien to scout the remaining area while you continue forward, "Darien, go the other way and meet us in the back chambers. We want to make sure Nocturnal's earl didn't leave us any surprises." Darien accepts it, but will remind Leythen, "I'll go, but if this is just a ploy so you can betray us, you'll have to deal with me." The way toward the back chambers is quite straightforward. You will however encounter a big yaghra monstrosity - Krezzinlor - on the way and will have to defeat it before continuing. Earl Leythen: "Meet me outside and we'll make contact with my Prince." Outside the ruins, Leythen will summon Mephala. He stands straight, spreading his arms wide and saying loudly, "Mephala, appear before your faithful servant!" In front of him, a red summoning circle will appear and a red glowing manifestation of Mephala is summoned shortly thereafter. Mephala: "I answer my earl's summons, only to find him with these ... unworthies. Do you betray me too, Leythen?" Earl Leythen: "Never, my Prince. We share a common enemy now. Please, talk to them and hear what they have to say." "Remaking the world to eliminate death and disease is one thing. Destroying everything to turn yourself into a being of infinite power—well, that's something else entirely." Valsirenn: "You were a terrific father to our daughter, Leythen. I'll never forget that." Earl Leythen: "You were always Ealdaawe's hero, Val. I envied the way she looked up to you." Valsirenn: "I ... I'm sorry, Leythen. I should have been there with you. With her. At the end." Earl Leythen: "You were trying to save her. I know that. It was just ... damn it, we need to win this, Val." "This shrine, Val and I built it for our daughter after she died. High Elves don't bury their dead, but we needed something to remember her by. She loved climbing this tree before the illness took her. I forgot how beautiful it was." Can I trust you to help us in this? "With the Psijic Order and my Mistress Mephala aligned toward a common goal, I'm feeling practically giddy with anticipation. But never fear. I'll reestablish contact with my Prince when called upon to do so. I gave you my word." What did you hope to accomplish with the Court of Bedlam? "The Court offered me a purpose after my life lost its meaning. Our Princes promised to remake the world, turn it into a better place. A paradise. And they were going to elevate the Altmer back to their status as gods. Suffering would come to an end." Isn't that what Nocturnal still wants to do? "Not in the least. Remaking the world to eliminate death and disease is one thing. Destroying everything to turn yourself into a being of infinite power—well, that's something else entirely. Mephala will see that and provide the help you need." Speaking to him again will result in Leythen telling you, "Even after being gone so long, I could never forget this place. I can still hear the sounds of my little girl's laugh as she climbed this tree, giggling and shouting at Val and I to watch her. It's a memory I'll forever cherish." Make your way to the Dreaming Cave, where your allies are waiting for you. The preparations for opening the way to the Crystal Tower have been completed. 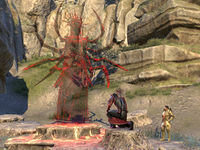 Leythen stands among others, ready to summon Mephala, "I can establish contact with Mephala. She's ready to appear if you're willing to lower the defenses." Speaking to him at this point reveals Leythen looks forward to confront Nocturnal, "Sotha Sil allowed Barbas to come to Artaeum so he can lead us to the Crystal Tower. In a moment, he'll also open the way so that my Prince can attune the diamonds for us. Then we can attack Nocturnal directly. I'm actually looking forward to that." After Mephala has been summoned, you will talk to her and she will then attune the diamonds. However, she requests that you take Leythen with you to the Crystal Tower. After that, Barbas will open a portal to the Fields of Regret, through which you will be able to reach the Crystal Tower. You and your companions - Darien and Leythen - are now ready to enter the portal. Valsirenn: "Leythen, promise me you'll keep them safe!" Earl Leythen: "I promise, Val." After traveling through the portal, you will arrive in the proximity of the Crystal Tower. Darien will at this point comment, "I bet Nocturnal knows we're coming. So much for the element of surprise." Leythen in his turn wonders, "Where's Vile's Hound? Has he abandoned us already?" If spoken to, Leythen continues, "If Vile and his Hound have already betrayed us, I'll turn that mangy mutt into a throw rug!" Once inside the tower, Darien is surprised about how untouched the interior seems to be of the chaos, "This place looks surprisingly intact." Leythen then explains, "The interior and the exterior of such places rarely coincide perfectly. I pity the Sapiarchs that were present when Nocturnal unleashed this magic." Speaking to Leythen here will only yield a short response: "It's a tower, so now we climb." Darien Gautier: "A dead end? Did we make a wrong turn?" Earl Leythen: "Wait. The tower ... it's moving. Fascinating! It appears to be reconfiguring itself!" Darien Gautier: "Then let's get moving before the tower remakes this platform out of existence!" Earl Leythen: "I expect we'll see more evidence of this malleable nature the higher we climb." Darien Gautier: "Look at this place! Part of the ceiling has fallen in!" Earl Leythen: "Yes, but what happened to the shadow Sapiarchs? They were thick as crows on the lower levels." Sapiarch Nolyemal: "Stay... stay back!" Sapiarch Nolyemal: "I don't know how you entered the tower ... but you must get out of here." Darien Gautier: "She's still alive! We have to help her." Sapiarch Nolyemal: "No, stay back! The relic that protects me, it's failing. You can't help me." Earl Leythen: "She's right. Look how she's starting to fade." Sapiarch Nolyemal: "I don't want to die!" Earl Leythen: "Let me help you. Clear your mind." Sapiarch Nolyemal: "It's so hard ... to concentrate ...."
Earl Leythen: "Think of your loved ones. Picture their faces and my magic will help you." Sapiarch Nolyemal: "I see them. The pain ... is fading. I can see—"
Darien Gautier: "She ... she's gone." Earl Leythen: "Her last moments were peaceful. I saw to that." Earl Leythen: "Curious. From the opening in the ceiling, it appears that we're no longer in Vile's realm." Darien Gautier: "So that's what they meant when they said the tower was in every realm at the same time!" Darien Gautier: "Where did she come from?" Earl Tundilwen: "Nocturnal's started to repair Transparent Law. Soon none of this will matter." Earl Leythen: "No, you mustn't do this!" Earl Tundilwen: "Why do you insist on prolonging your pain, Leythen?" Earl Leythen: "You know nothing about pain!" Earl Tundilwen: "A pity. I thought we were the same. No matter. Your quest ends here." Earl Leythen: "She's just trying to slow us down. Meet me up at the gate pedestal!" "We must be nearing the pinnacle of the tower. That's why Nocturnal sent her champion to slow us down. Nocturnal's earl damaged this mechanism beyond repair. Even if we had acquired the key, I'm not sure it would have opened the gate." Do you know how we can get through the gate? "Sapiarch magic is powerful, but not as powerful as the magic of the Psijic Order. Since we don't have the key, I can try to overcome the damaged mechanism and then follow after you." "I can operate the mechanism manually from here. Then, once you and Darien are through the gate, I can teleport across and make it to the other side before it snaps back shut." All right, open the gate. Earl Tundilwen: "I have to stop you here. All of you." Earl Leythen: "I wondered if you'd actually show yourself instead of just projecting menacing images." Earl Tundilwen: "A closed gate won't save them, Leythen." Earl Leythen: "No, but this will keep you busy for a time." It turns out Leythen was hoping that Tundilwen would show up like this, as he would then get a chance to stop her from following you. He teleports right next to Tundilwen at the gate and uses an immobilizing spell on her. However then they briefly disappear, possibly due to the shifting realities inside the Crystal Tower. Leythen then reappears - alone, visibly shaken, and surrounded by a strange dark aura. Darien Gautier: "Where'd they go?" Darien Gautier: "Is Leythen ... gone?" Earl Leythen: "That should keep her busy ... for a short time, at least." Darien Gautier: "Um, why are you glowing?" "I was overconfident, I'm afraid. Valsirenn always said I was too sure of my own abilities. I just assumed I'd be able to get back to the protection of the Resolute Anchor before I was unmade. Pity. I would have preferred a more heroic ending." This was your plan all along? "I had to do something to get rid of Nocturnal's champion. At least for a little while. Beyond that, I really did hope that a moment outside the anchor's protection wouldn't be fatal. Just something else you can tell Valsirenn I was wrong about." So that's it? There's nothing we can do? "You can stop Nocturnal. I'd really rather not see you and the knight wind up with this fate. And, if all goes well, you can tell Valsirenn that ... that I'm sorry. Now, hurry. Nocturnal's earl won't be gone long." "Tell her... tell her I'm going to go be with our daughter. Tell Val... that we will... we will wait... for... her..."
Thanks for giving us a fighting chance. "I should be thanking you. You had no reason to trust me, yet you did. And you gave me a chance to see my wife ... to reconcile with her in a way. Now, go and beat Nocturnal. I have faith in you!" After everything you did, this end is too good for you. "Yes, that's the spirit! Show me the anger you've been hiding! I'm fading away quickly, while you're about to suffer an eternity at Nocturnal's hands. Regardless, I must thank you. You gave me a chance. You let me see Valsirenn one last time." What should I tell Valsirenn? "Tell her ... tell her I'm going to go be with our daughter. Tell Val ... that we will ... we will wait ... for ... her ...."
With these words Leythen collapses to the ground as his body disappears, consumed by the shadows. After a brief moment of silence, Darien reminds you of the task you came here to do, "We should ... we should keep moving. There's nothing more we can do here." Immediately after Leythen's death, neither you nor your allies will have time to mourn his death. Atop the Crystal Tower, however, Valsirenn will ask you about Leythen. When given the news about his death, she is shocked, but will force herself to focus on finishing the task, stuttering, "Leythen ... I'll ... I'll mourn for Leythen later. I'm just glad he helped you. He would have made our daughter proud." After confronting Nocturnal, restoring the Heart of Transparent Law, and ensuring that the plans to protect the Crystal Tower have been made, you can find Valsirenn back on Artaeum. When you talk to her there, she tells you how it is good to see you again, and that she has had time to both recover and mourn the ones who lost their lives during the conflict. When you ask her how she feels about Leythen's death, she admits, "Sad, of course. I think I understand him better now. I plan to remember what he sacrificed in the end. What he did to help us." She then pauses, before saying, "Leythen and my daughter, they'll always be here, in my heart. Always." When you comfort her, she turns her head away as if wiping a tear off her cheek, "I'm sorry, but this is still so hard to talk about. Finding Leythen after all these years, only to lose him again .... It was incredibly difficult." Leythen is voiced by Time Winters (IMDb). 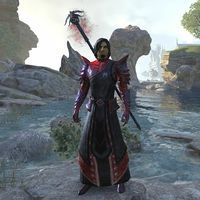 He wears the Court of Bedlam robe; this outfit was also available to players for pre-ordering Summerset chapter. During the quests when Leythen acts as your follower, he will use the Psijic Skill line abilities to assist you. This page was last modified on 4 February 2019, at 14:36.